EOTech Extreme-XPS Holographic Weapon Sight - Model EXPS3 FREE SHIPPING! The Extreme-XPS EXPS3 Holographic Weapon Sight from EOTech takes the original XPS3 design and adds additional tactical functionality. Retaining the same compact style as the original model, the Extreme-XPS includes a transverse mounted battery to reduce rail space to just 2.75-inches. Side buttons and a quick-release throw lever make it easy to attach and detach the sight from firearms. Its parallax-free holography and unlimited eye relief offer true, two-eyes-open shooting to facilitate rapid transitions between targets, while its anti-glare coating and high level of fog and water-resistance guarantee optimal levels of performance in all weather conditions. 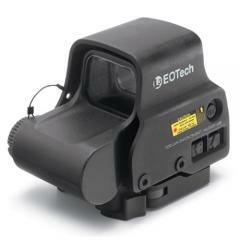 EOTech's sight comes with a choice of two reticles, a 65 MOA circle with either one or two aiming dots. Both are adjustable through 30 brightness settings using a convenient scroll function, 20 for ordinary use and 10 for use alongside night vision equipment. The single, 123 lithium battery provides 600 continuous hours of use at brightness setting 12 and features an auto-battery check indicator and automatic shutdown feature to preserve power. ©2002-2019 CopsPlus.com: EOTech Extreme-XPS Holographic Weapon Sight - Model EXPS3 FREE SHIPPING!